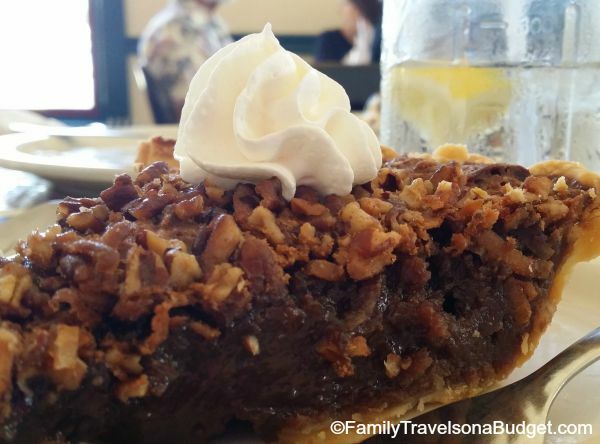 Yesterday, I shared my top ten list of reasons to visit Alton, Illinois and promised the recipe for Mrs. Ledbetter’s Chocolate Pie. Ann Badasch, the owner of “My Just Desserts” has been serving this pie forever (or 1989… close to forever). And, while my version turned out quite tasty — sweet, crunchy, gooey and coconut-ty, it wasn’t quite as good as hers. Maybe when I make it 3,000 more times, I’ll have the recipe mastered too. Or maybe, this old-fashioned recipe just tastes better in its traditional setting, the historic Ryder Building, where Abraham Lincoln practiced law. Today, the building is one of the first stops on the historic Lincoln & Civil War Legacy Trail. The restaurant preserves much of that old, frontier town feel with quilts on the walls, creaky floors underfoot, and classic farmhouse kitchen tables for guests. Perhaps, the charming setting and friendly staff make the restaurant version make it seem to taste better? You know? I don’t know… but I can confidently say this recipe is easy, tasty and sure to please! Add sugar, cornstarch and salt. Beat until smooth. Top with coconut and pecans. 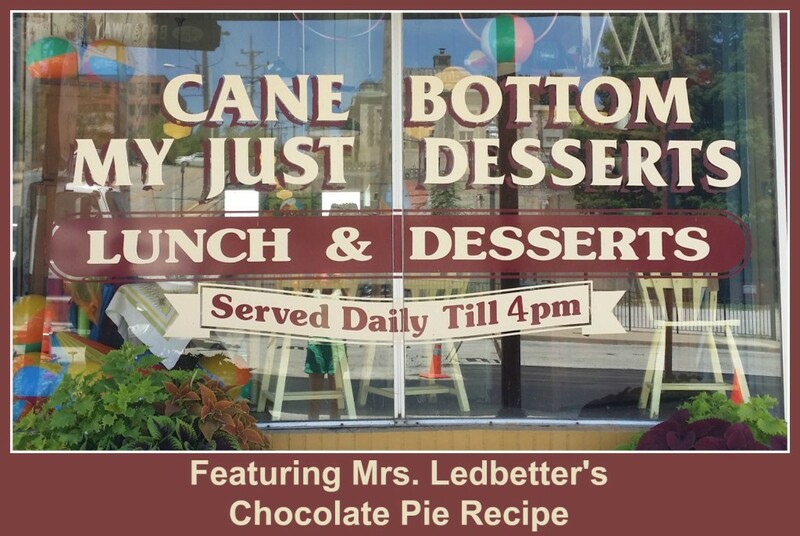 When you visit Alton or nearby St. Louis, be sure to include lunch AND Mrs. Ledbetter’s Chocolate Pie at My Just Desserts! The menu, the decor and the historic building combine perfectly for a memorable experience! That pie looks incredible, and how generous of Ann to allow her recipe to be featured on your blog. If I had a recipe that looked that great I’d probably be a little more stingy with it, but that’s just me! Yummy, this looks so good. I haven’t had pie in a long time. Oh goodness! I can’t believe those are pecans! I love pecan pie and I love chocolate! My mouth just watered! lol! I’d love to give this recipe a shot. Both my daughter and I are chocolate fans so I’ll have to make this before she starts her competition diet. I never thought of making a chocolate pie before. This is awesome! Thanks for the recipe. Drool!!! That pie looks delicious and the perfect Fall dessert. It’s the newest addition to our Thanksgiving menu! How is it possible to love chocolate yet I have never tried chocolate pie! I was going to bake an apple pie but I’m going to give this recipe a try instead.